CANNONS & PATRIOTS are out - HEAT Opens NBC World Series Today @ 1PM! Today (Friday) is the BIG DAY for the WELLINGTON HEAT. The club finished up regular season and tournament play as League and League Tournament Champs, with a 40-9 record! The HEAT was named the 2018 Organization of the Year. Today, none of that matters much. It's opening day at the 2018 NBC Baseball World Series at Lawrence Dumont Stadium in Wichita and in the Championship Week opener that begins at 1PM today, it will be our very own HEAT going up against the San Diego Stars. Unfortunate news from Thursday's "WIN & IN" games featuring the Mulvane Patriots in one and the Kansas Cannons in the other. Neither will advance on to Championship Week, both after great runs through "First Week" pool play action. On Thursday, the Patriots came up short vs the San Antonio Angels 9-2. In Thursday's nightcap, it was the Colorado Cyclones over the Kansas Cannons 4-1. Season ends for both. Good Luck today to the HEAT - for live streaming of the NBC Tournament, go to www.nbcbaseball.com - GO HEAT BEAT SAN DIEGO! The WELLINGTON HEAT wrapped up their "HOME" appearances the past couple evenings down at Hibbs-Hooten, hosting the Cheney Diamond Dawgs in what amounted to "warm-up games" for both squads at the NBC World Series Baseball Tournament which begins tomorrow (FRI, Aug. 3rd) at Lawrence-Dumont Stadium in Wichita. (Cheney won both of these games) The "First Week" pool play action wraps up today as well, 16 teams began the journey to be included in the CHAMPIONSHIP rounds of this tournament and we are down to "4". They square off this evening, the 2 winners will advance to the Championship Round. GOOD LUCK to the PATRIOTS & the CANNONS! Tonight (THU) @ NBC Tournament - the WIN & IN games!! Don't forget - the WELLINGTON HEAT will be starting off the CHAMPIONSHIP round at the NBC BASEBALL WORLD SERIES on Friday at 1PM vs the SAN DIEGO STARS!! 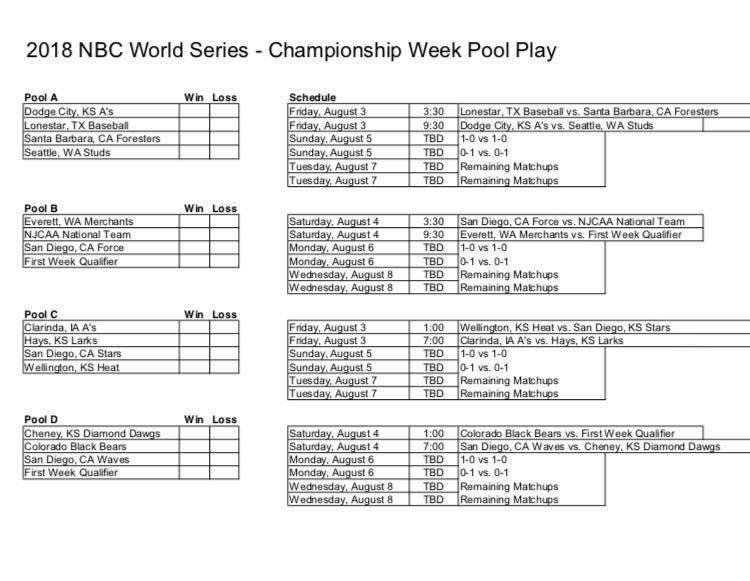 Game #20 of the Pre-Championship Week NBC World Series Pool Play is in the books and here are the records through Tuesday night's action @ Lawrence Dumont! SIDE NOTE: The Wellington Heat were slated to play Tuesday evening at Hibbs-Hooten vs Cheney Diamond Dawgs (warm-up game) - status of that game or results not available. They are slated to play again tonight (WEDS) at Hibbs-Hooten @ 7PM. After WEDS play, the other 2 "WIN & IN" teams will be determined and will go up against TEXAS ANGELS and MULVANE PATRIOTS Thursday to determine which 2 of those 4 teams advance to CHAMPIONSHIP WEEK action which commences Friday!